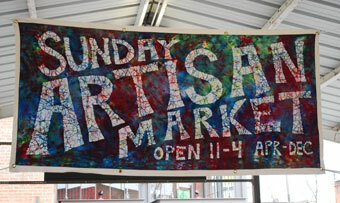 The Sunday Artisan Market banner, made by artist Cheri Reiman, who sells tie-dye clothing at the market. Maybe it was pre-FestiFools roaming, or maybe it was spillover from the NCAA tournament in Detroit – whatever the reason, crowds were bigger than on any previous opening day at Ann Arbor’s Sunday Artisan Market, according to the group’s vice president, Joan Hutchinson. It wasn’t clear whether those people were actually buying, though – vendors we talked to had mixed experiences. 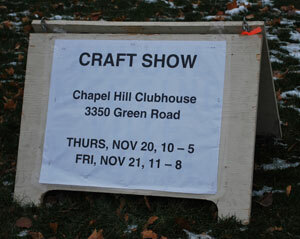 Look for these signs to guide you to the Chapel Hill clubhouse, off of Green Road. This year, Judy White organized her first holiday craft show, held today and Friday at the Chapel Hill Clubhouse on Ann Arbor’s northeast side. Here’s a quick Chronicle guide to how she pulled it off – we’d also encourage you drop by and check out the final result, where 15 local crafters will be selling wooden bird houses, jewelry, aprons, photographs, scarves, ornaments and other handmade items. 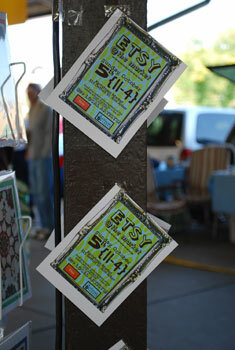 Some signs at the Sept. 28 Artisan Market, promoting the Oct. 5 Etsy show. Kate Kehoe has lots of energy, creative and otherwise. You get a sense of that if you visit her booth at the Sunday Artisan Market, where she sells notebooks made out of vintage album covers and video boxes, LPs formed into bowls, a variety of cards and pins – all made by her, by hand. She’s also funneling a good bit of energy into organizing the Oct. 5 Etsy show, where about 30 vendors – mostly from the Ann Arbor area – will be selling their wares in this second annual event, held in the Ann Arbor Farmers Market area in Kerrytown.